It’s time for our monthly Gratitude Circle post and for a moment, I wondered if I would run out of things to write about. Why, you wonder? Because I’ve been linking in to the Ten Things of Thankful linky over the last few Saturdays and covered quite a list in my posts during the month : Thankful Seeds and The Quiet Joy of Gratitude. However, I decided to share my list and review The Gratitude Diaries too. But there’s always something more to be grateful for, isn’t there? So here’s my list for the week. I’ve not been too well – a cold, fever and a dull headache – but I’m so grateful that I get to be at home. No boss that I have to request for leave! A husband who takes good care of me – even pampers me! Thanks, José. A wonderful maid, who noticing that I wasn’t well, went above and beyond what she is expected to do. The mad frenzy of painting that I started. No, I’m not good at it, but I certainly love playing around with paints, colours and mediums. Sheer joy! My brother finding so much joy and recognition in his chosen area of work and that all his years of passionate study and pursuit of this hobby is paying off handsomely. As always, books – I can’t seem to keep up with all that I have and keep getting more! Good conversations and discussions on sometimes difficult subjects, via my blog, Facebook and other blogs as well. Bloggers who inspire me, like Rena McDaniel who shares her struggles with her Mom who has Alzheimer’s. Presently, Rena and her team are raising funds for a Walk To End Alzheimer’s. Please click on the purple flowery button on this blog’s sidebar to find out more and donate to this cause. Generous corporations like Google which launched a donation-matching campaign to raise $11 million for refugees. Okay, so we can be cynical and say that they’re doing it for publicity or can afford to, but remember Steve Jobs and Apple – they could afford it too and hardly ever did. This one I can’t resist adding to my list! New research shows five perks of being overweight! Will the obese (me too) have the last laugh? 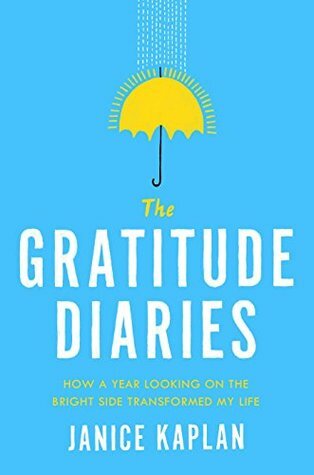 Today I’m also reviewing, The Gratitude Diaries, a fabulous book I read, thanks to NetGalley (in exchange for an honest review). In this inspiring memoir backed by pioneering research, Janice Kaplan spends a year living gratefully and gains a fresh outlook that transforms her marriage, family life, work, health, and every day experience. On New Year’s Eve, journalist and former Parade editor in chief Janice Kaplan makes a promise to be grateful and look on the bright side of whatever happens. She realizes that how she feels over the next months will have less to do with the events that occur than her own attitude and perspective. Getting advice at every turn from psychologists, academics, doctors, and philosophers she brings readers on a smart and witty journey to discover the value of appreciating what you have. Relying on both amusing personal experiences and extensive research, Kaplan explores how gratitude can transform every aspect of life including marriage and friendship, money and ambition, and health and fitness. She learns how appreciating your spouse changes the neurons of your brain and why saying thanks helps CEOs succeed. Through extensive interviews with experts and lively conversations with real people including celebrities like Matt Damon, Daniel Craig, and Jerry Seinfeld, Kaplan discovers the role of gratitude in everything from our sense of fulfillment to our children’s happiness. Janice Kaplan is successful writer, television producer and magazine editor, she was the Editor-in-Chief of Parade magazine where she did cover stories with everyone from President Barack Obama to Barbra Streisand. At the time,Parade was the biggest magazine in the country, reaching 73 million people each week. Janice was deputy editor of TV Guide magazine and executive producer of the TV Guide Television Group, where she created and produced more than 30 television shows that aired primetime on ABC, FOX, VH1 and other networks. She began her career as an on-air sports reporter for CBS Radio and went on to be an award-winning producer at ABC-TV’s Good Morning America. She is the author and co-author of twelve books, including the New York Times bestselling memoir I’ll See You Again, written with Jackie Hance. Her popular novels include The Botox Diaries, Mine Are Spectacular! and The Men I Didn’t Marry and the Lacy Fields mysteries Looks To Die For and A Job To Kill For . Her books have been translated and published in more than a dozen countries. Connect with her on Facebook and Twitter. Read the preface of The Gratitude Diaries here. Cultivating an attitude of gratitude has been a life-changing experience for me. To read another person’s story and see this happen in her life is very inspiring to me. Kaplan asserts that applying the lessons of gratitude research into her daily life brought improvements in her mood, relationships and health. I’ve seen that happen too. Her book though anecdotal is based on research of science of gratitude and she has included a lot of interviews with prominent researchers in this field as well as celebrities. There has been some criticism of Kaplan to say that she lives in a very privileged neighborhood and it’s natural that she would be grateful. I disagree with this view. The fact that someone is educated, rich or famous, doesn’t make them grateful. Gratitude is a choice and one that Kaplan made on a day to day basis. If you want to be convinced that gratitude, when practiced consistently, can have a life-changing effect on you, then this is the book to pick up. If you are taking part in the September Blogging Challenge please add your links to this linky. Love this list and the book you review. They go together perfectly. Loved your Gratitude List Corinne. There is always something to be grateful about. Well, cold bug me too this time so I am grateful I recovered quickly. Painting? Wow. Show us some pictures. I am also grateful that you start new writing challenges like the recent weekend one 🙂 Keep doing that! 😀 Happy October. That book sounds a good one. I will try and find it to read. Thank you for sharing! Hope you are feeling much better by now! Have a good week! Taking a painting class has been a dream of mine. Maybe I should stop dreaming and just do it. I’m very familiar with the Alzheimer’s world, because of my Mom. It seems like there are so many people I know who have a relative with Alzheimer’s or another type of dementia. I hope that a cure can be discovered. My grandmother has Alzheimer’s. It is an awful disease, and I hope a cure is found someday. I trust you are back to full health now, Corinne. Thank you for sharing the many things for which you’re grateful! Corrine, I just love your thankfuls! I do pray you are feeling better, and yet I am just so glad you have a husband who cares for you and loves you! I want to see your PAINTINGS!! And you made a great point about google- versus the others… so yes, they are doing SOMETHING, which is a good thing. The Gratitude Diaries sounds like an inspiring book, and just perfect to have you share that in this post. I need to check it out! I trust you are, by now, on the mend (or at very least on the mend!) when you said ‘painting’ my first visual was Sherwin Williams… then I read more carefully lol that is one diversion I have not been tempted by…too much talent required! Hi Corinne…wonderful post. I’m intrigued by Janice Kaplan’s book now. I’ve been practicing gratitude for so long it’s become second nature. Makes life easier. I was in the same boat as you with your illness this week…so I feel ya! I hope you’re feeling better. I hope you are over your illness quickly. Your husband must be a lovely man to pamper you while you’re sick. Please feel better, Connie. I’m glad you have love and support around you to help when you are not feeling your best. I love that your items of gratitude include ways to activate that gratitude into giving and helping. Oh and the last link, love #5. Have a good week I enjoy reading your posts each time. It is always so refreshing to read something positive and uplifting. Thank you for the timely reminder to be more grateful. It’s amazing after a bout of what looks like flu you still have it in you to be grateful for so many things! And you’re right about the last one….fat people are happy ( ask me) have you ever seen a thin person have a hearty belly laugh, the one that leaves his tummy shaking? I have been looking for something new to read and I think I am going to get this one. I have a lot of stuff going on in my life right now and I need the reminder of gratitude. Thank you so much for linking this post to my linky #MidLifeLuv. I always feel uplifted when reading your posts. I enjoyed your book review – very thought provoking! Thanks for sharing although you can keep your cold germs to yourself! LOL! I did NOT send you my cold symptoms via the internet, so it is NOT my fault, OK? Just want to be sure since Alpha Hubby is trying to blame me for his!! I always enjoy your gratitude posts. They keep me focused on being positive! We work very hard to do that in our life, our marriage, our careers, our family, and in everything we do. It does get easier to see the positive and be grateful for every little thing, big and small in our life. It, too, is a self-fulfilling prophecy. I’ve lived long enough now to see the results of speaking peace and gratitude – things go SO much better! Thank you for inspiring!! A beautiful gratitude list Corinne I am slowly realizing how important to look at the brighter side when the going gets tough!! Gratitude posts are certainly happy posts. No fun being sick, hope you get to feeling better soon! Yes, they are. Thanks, Kathy. Much better now. Thank you so much Corinne! I appreciate the support you give me so very much. Feeling gratitude in life has made so many changes in mine. I always try to be positive, but there was a time that wasn’t the case. Loved the review! You’re very welcome, Rena. Thanks for being you! I’m always worried about getting too dependent on her. We managed very well without one for years in Mumbai. I guess it’s like the crafts you’re trying out, Mahathi. I’m just having fun with this. i love the list. The last about perks of being overweight is too good. I enjoyed the review of the Gratitude Diaries. Gratitude keeps us cherished. Hope your health is getting better now. Please take car. Thanks for sharing your list …. Thanks, Vasantha. I’m better already! I have been looking for that book! So lovely to see the review, Corinne! I have to laugh at no.10! So cute. Sending you loving vibes to get well soon! Hugs! Thought you might have snagged it on NG too, Vidya. I hope you are feeling better Corinne….Take care of yourself! I think once we sign on to the idea, it becomes a part of us. I try to re-write my words when I start to grumble. Writing these posts helps too, Naba.